Two weeks ago at the Berlin workshop on shrinking space for civil society, we discussed the need to continue to use the media, whenever possible and opportune, to visualize the work of human rights defenders in a positive way. In light of that, I would like to call your attention to the possibility to nominate human rights defenders for the Dutch HR Tulip Award. The prize aims to select candidates that combine courageous work and innovative approaches. It is an interesting human rights award for several reasons. The space for civil society protest is shrinking in many countries and human rights defenders are being curtailed and persecuted. We need to support their important work and def end their right to speak out on human rights violations and do their peaceful work without fear and repression. Being an official award from the Netherlands government, the Tulip award constitutes an important statement and a contribution to upholding international human rights. For participating nominees, the web-based voting procedure means a lot of public attention that may empower them and help them to make more visible their work. Thirty nominees will be selected for the shortlist and published on the website for public voting, which will attract a good deal of publicity. Last year, almost 60,000 people from over 20 countries cast a vote. The final winner will also receive a substantial financial support for the work of his/her organisation. So please help us spread the call for nominations amongst your contacts around the world. Below background information on the award, which you can share with your mailing lists, partner organisations, networks and so forth. This year, we have diversified the poster/banners in the toolbox, so you can pass on the call for nominations in Chinese, Arabic, Russian, Spanish, and French. The nominations, however, must use the standard nomination format in English that can be downloaded from the official website. Well argued and completed nomination forms can be sent by 16 July to tulip@hivos.org, where we are hosting the logistic secretariat. There is a short video that can help encourage people to nominate an individual or organisation for the Human Rights Tulip 2015. Digital posters, available in English, French, Spanish, Arabic, Russian and Chinese, also encourage people to nominate an individual or organisation for the Human Rights Tulip 2015. They are provided in English, Dutch, French, Spanish, Arabic, Russian and Chinese. 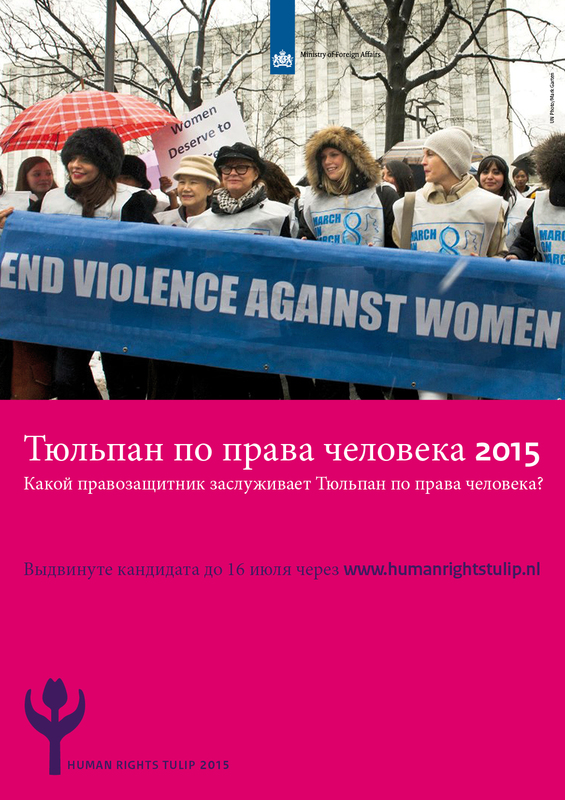 We invite you to share the posters digitally: on your website or through social media channels. The posters can also be printed. More examples can be found in the toolbox that is downloadable from the website. Thanks so much for passing on the information to your networks and helping to make this a successful campaign again. 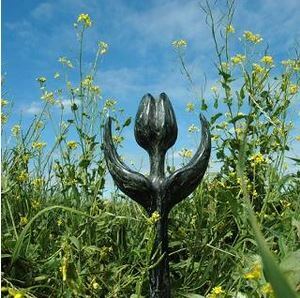 The Human Rights Tulip is an annual award for human rights defenders who promote and support human rights in innovative ways. The Human Rights Tulip is awarded by the Dutch Ministry of Foreign Affairs. Individuals and organizations can win global recognition for the important and innovative work being done. Human rights defenders anywhere in the world can be nominated. 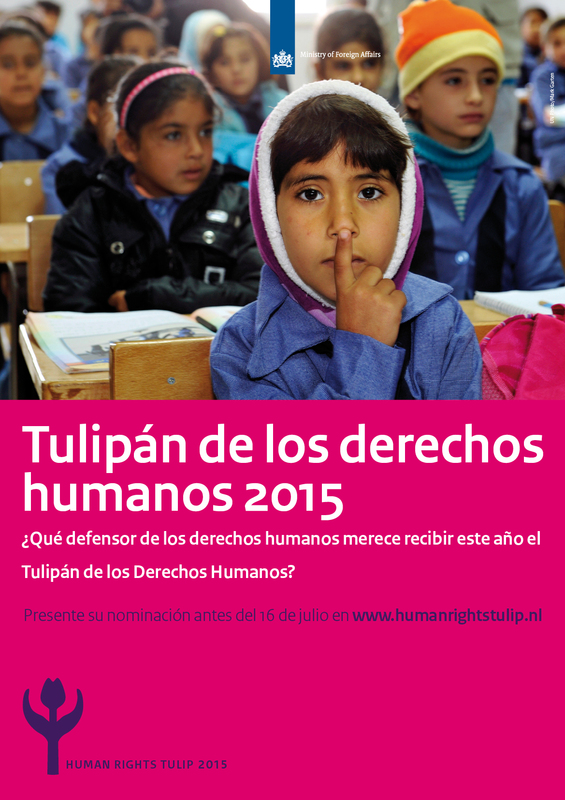 The Human Rights Tulip has been awarded since 2008 to human rights defenders in various countries. Since 2013, the focus of the award has shifted to the promotion of human rights in innovative ways. This way, human rights defenders worldwide are able to learn from each other. Last year the Tulip was awarded to Mideast Youth. This organisation creates online platforms for under-reported and censored voices advocating for human rights throughout the Middle East, North Africa and beyond. Anyone is welcome to put forward a candidate between now and July 15, 2015 by filling in the form on www.humanrightstulip.nl. You can also nominate yourself or your own organisation. The nominees will be announced September 9, after which the public voting starts. After the voting period, 6 candidates remain: three public favourites and three wild cards. An independent jury will then advice the Dutch minister of Foreign Affairs, who will select the winner. In consultation with the winner, a working visit to the Netherlands will be organised to coincide with the award ceremony in The Hague on December 10, 2015. The award furthermore comes with support worth € 100.000,- to assist the winner to further develop and scale up their work.